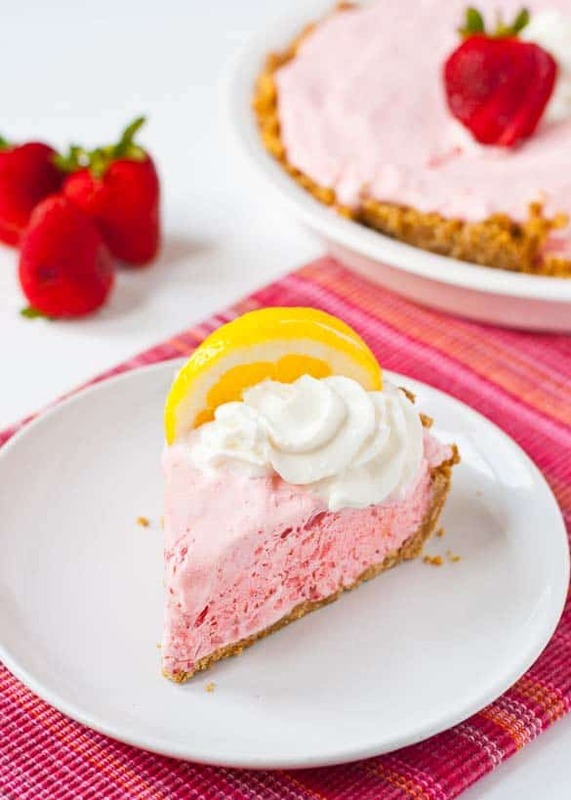 This Frozen Strawberry Lemonade Pie is fluffy, light, and refreshing. Plus, it’s no bake and easy to make gluten free! To me, it’s just not summer until I’ve had my first Lemonade Shake Up. Do you know the ones I’m talking about? Lemonade Shake Up trucks typically dot the streets of summer festivals and fairs, their counters filled with cups of whole lemons and sugar waiting to be shaken into a frenzy of sweet, puckery lemonade. The shake up truck is always the first thing I look for when we go to a festival. Strolling the streets of Columbus on a hot summer day, sipping lemonade, and perusing the arts and craft booths–that, my friends, is the definition of summer. But you know what would make those lemonade shake ups even better? Strawberries. Because everyone knows the only thing better than a glass of ice cold lemonade is a glass of ice cold strawberry lemonade. 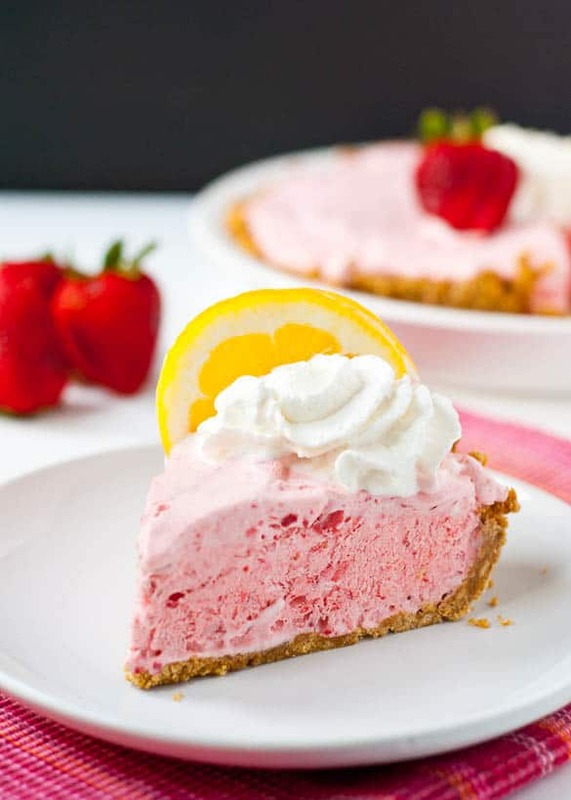 My obsession with this summer flavor inspired this easy, no-bake, Frozen Strawberry Lemonade Pie. This recipe is based off of an old family favorite–Frozen Strawberry Fluff. I absolutely adore this light, creamy frozen treat, but I’ve always been a little wary about serving it to guests because it contains raw eggs. That’s why I was absolutely thrilled to discover Davidson’s Safest Choice Eggs, a line of pasteurized whole eggs that are perfectly safe to consume in their raw state. Do you realize what this means? It means licking the beaters, munching on raw cookie dough, and making the creamiest Caesar dressing around. It means not worrying about whether my penchant for stealing bites of uncooked dough will eventually land me in the ER. Now if only these eggs could also protect me from gaining a pants size. Hey, a girl can dream right? Anyway, I knew I wanted to use Davidson’s eggs to make this old favorite, but I wanted to create a new recipe that would embody everything I love about summer. The original recipe is dressed up with chocolate, but I wanted something a little lighter, something refreshing and sweet with a teensy sour punch. 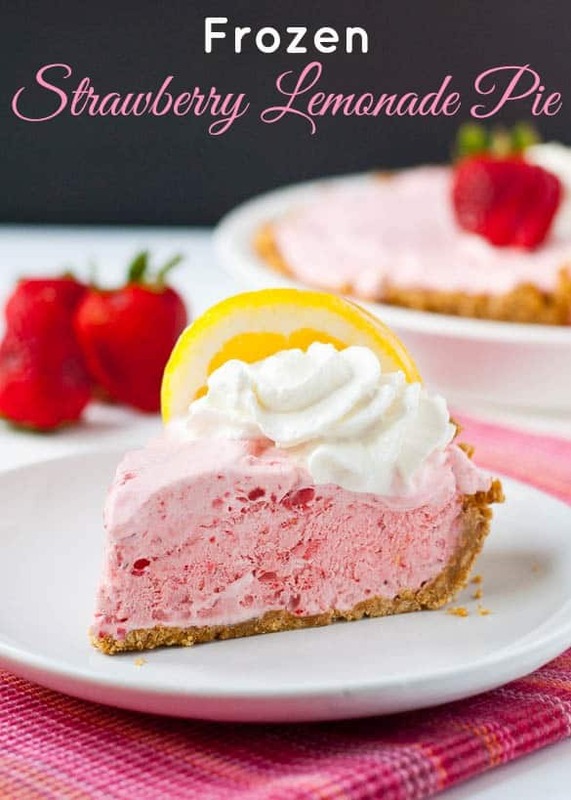 I wanted a pie that reminded me of my favorite summer drink, and this Strawberry Lemonade Pie fits the bill perfectly. Let’s chat for a minute about how this goes down. It starts with an easy graham cracker crust. Butter, grahams, sugar. You can’t go wrong. From there you’ll add the mostly-thawed frozen strawberries and let the beaters break them up into bite sized chunks. I like using frozen strawberries rather than fresh because they seem to distribute throughout the pie a little better. Plus, it gives the mixture this glorious pink color. Trust me, you’ll want to lick the beaters. And the best part is, it’s totally safe to do it! The fluff mixture gets spread out over the graham cracker crust then frozen for at least 6 hours or overnight. The next day, this pie will be ethereally light and creamy. Cool and refreshing, the sweet strawberries and zesty lemon flavors literally melt on your tongue. I can’t think of a better way to end a hot summer night. 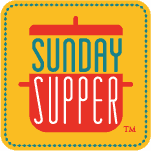 My #SundaySupper friends have come up with nineteen more no-bake summer treats using Davidson’s Safest Choice Eggs. If you’d like to pick up a carton for yourself, check out their store locator, or learn more by connecting with them on Facebook, Twitter, and Pinterest. Davidson’s is also hosting a No Bake Summer Recipe Contest. A ticket to the Food and Wine Conference + a $500 gift card is on the line, so if you have a no-bake recipe to share, head on over to the contest page. I hope you enjoy this cool, refreshing treat! Be sure to lick the beaters for me! For the crust, combine butter, crushed graham crackers, and 1/4 cup sugar in a large bowl. Stir together until the mixture begins to adhere to itself. You should be able to pinch a small amount at a time and have it stick. If it doesn't, add a Tablespoon of water at a time until it does. Divide the graham cracker crumbs between two 9 inch pie plates, using your fingers to press the mixture evenly across the bottom and up the sides. Place the crusts in the freezer while you make the fillings. Place the egg whites in a clean mixing bowl. 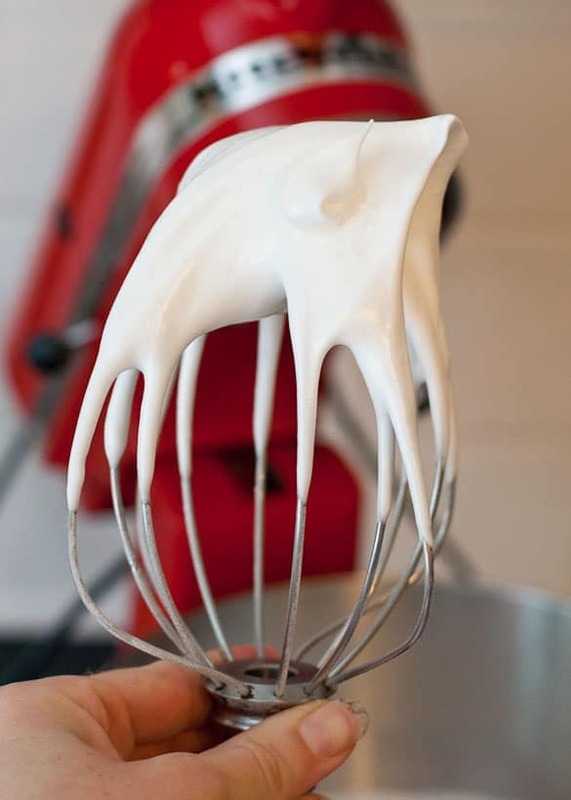 Use electric beaters or a stand mixer fitted with the whisk attachment to beat the egg whites on medium speed for 1 minute. Add the lemon juice. Beat on medium high speed for 4 minutes. The mixture will look foamy and limp. Add the sugar, a quarter cup at a time, beating on medium high speed for 1 minute after each addition. The eggs will take about 8 minutes total to whip up completely. 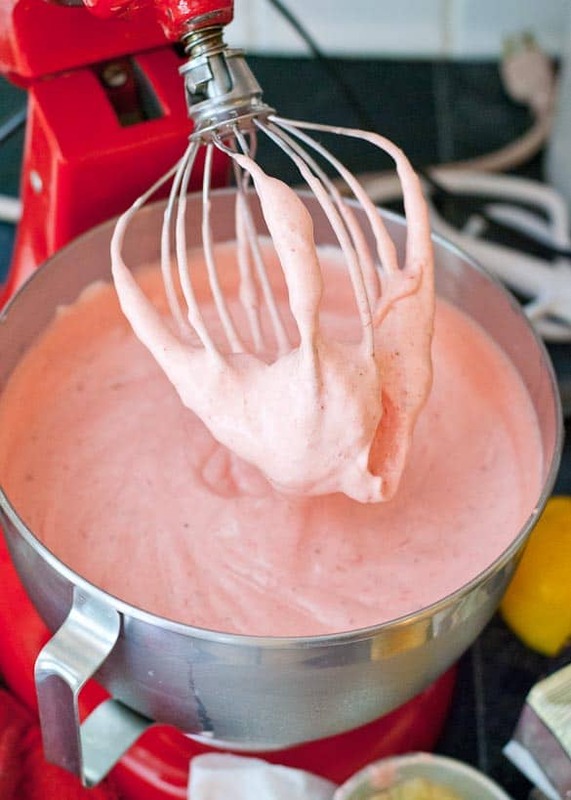 Add the frozen strawberries and beat on medium speed until they're broken up and evenly distributed throughout the egg mixture. Fold in the whipped topping. Divide the strawberry mixture evenly between the two pie pans. Cover and freeze for at least six hours or overnight. To serve, drop the pie plate in an inch of hot water for about 30 seconds to help loosen the crust. Then slice and serve. Since the size and potency of your lemons may vary, I suggest adding the juice of one lemon, taste testing at the end, and then adding the juice of a second lemon if you want it more puckery. Oh my goodness what a pretty pie! It is so perfect for summer. 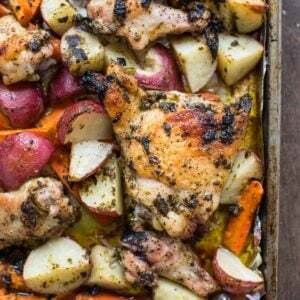 Courtney, I absolutely love this recipe!!! so so beautiful and what a great way to use the safe eggs! Pinned and can’t wait to try this! absolutely beautiful! I need to make your pie! I love strawberries and it looks so light and fluffy! That pie is mine, all MINE ! I cannot get over how fluffy and amazing that slice of pie looks! It is summer on a plate! 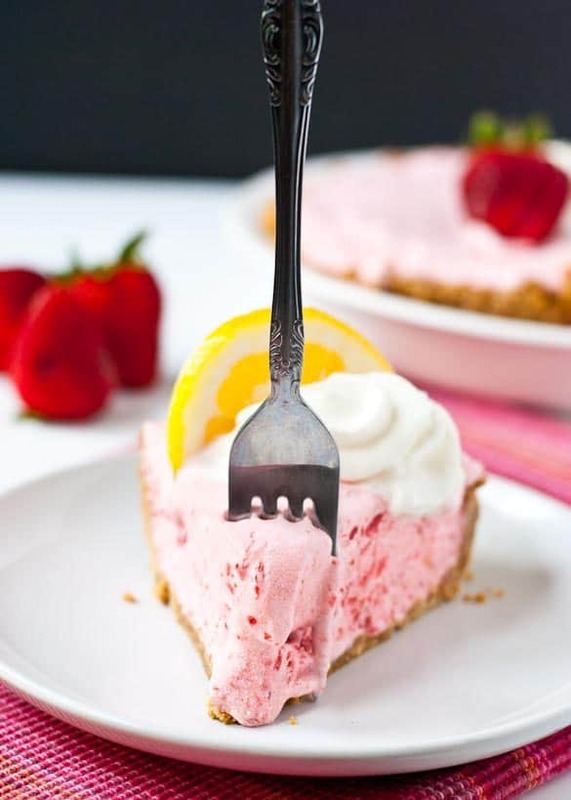 Strawberries do make lemonade shake ups even better and I am thrilled you incorporated them into this gorgeous pie. Great tip about using frozen strawberries! Sweet! This looks like something I want make for a party I am going to! I love it!!! What a fantastic summer dessert! I’ll definitely add this to our menu soon…I bet it tastes as amazing as it looks! This pie — OH MY! It just fantastic and the photography is amazing! This pie looks so light, love this combination, great tips! Perfect, perfect, perfect summer dessert. I’ve never, ever heard of lemonade shake ups!!!!! Making this the next time all the kids and g-kids visit us at the Lake. PERFECT!!!!!! Next time you’re at a fair, see if you can find them. They’re so good!! I hope you and the family love the recipe! What a perfect, summery dessert! And I’d love to enjoy a summer Saturday of lemonade and festivals! Yes! It’s my favorite way to spend a summer afternoon. This pie looks amazing! I could eat the whole thing in one sitting! Oh mylanta! This pie is GORGEOUS!! I seriously need to look for an excuse to make a pie now…. This is so beautiful! This is a perfect pie for summer…so refreshing and tasty! The color is gorgeous. Strawberry lemonade is perfect for the summertime! Talk about a dream dessert. That pink colour is ethereal and it looks as light as you describe it to be. I love strawberry lemonade and will gladly eat it in frozen pie form. Your photos are absolutely gorgeous. Cool Whip or the off brand version of cool whip. 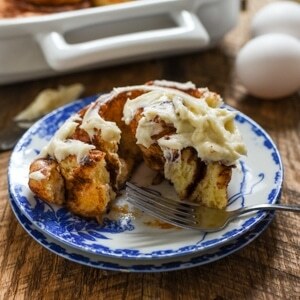 You can also use homemade whipped cream although it will be less sweet. This is dreamy, there is no other way around it. I always go for the a lemonade guy at the street fairs too. You can’t go to a street fair without fresh squeezed lemonade! I had no idea those drinks were called “shakeups” but I do love them, and now I’m going to start calling them that! They ALWAYS give me a sore throat, but it’s totally worth it! I cannot wait to try this pie. My Dad’s birthday is coming up soon, and I really think he’d like it. One question – in the recipe you have “Juice of 2 lemons (see note).” For the life of me, I couldn’t find that note. Did I miss it? Am I blind? Ha! That’s so weird that it gives you a sore throat! What’s up with that? An no, your eyes weren’t deceiving you. I forgot to write the note! Thanks for the catch! I don’t know! Crystal Light always give me a sore throat, too. But I attribute that to some weird additive or articifical sweetener that is in CL. hmmmm…hope there’s nothing shady in those shakeups! Do you think this pie would still be as delicious, if I subbed the butter for coconut oil? I’ve never tried subbing coconut oil for butter in a graham cracker crust, but it seems like it would work alright. I think it’s worth experimenting on! Easy peasy lemon squeezy! This looks and sounds luscious! I love the colors! Made this last night. My hard-to-please, 6 year old daughter loved it! We used one lemon, but I think if I were to cater this to an older crowd I would reduce the sugar and use the other lemon. I’m so glad your whole family enjoyed it Rigina! Thanks for coming back to let me know! Love the way that pie looks and I can’t wait to make it. Just curious, do you think this pie could hold up in a springform pan? I made this pie for my card club and was very embarrassed ‼️ It was awful 😖. It was too icy frozen but when I let it soften a little it turned to liquid. I have made the chocolate pie from egg whites and it was delicious so I don’t know why this wasn’t better. I do NOT recommend this pie. I’m so sorry to hear this didn’t turn out for you! I’m not sure what might’ve gone wrong. The pie definitely should stay frozen, but shouldn’t go completely to liquid when it’s softening.